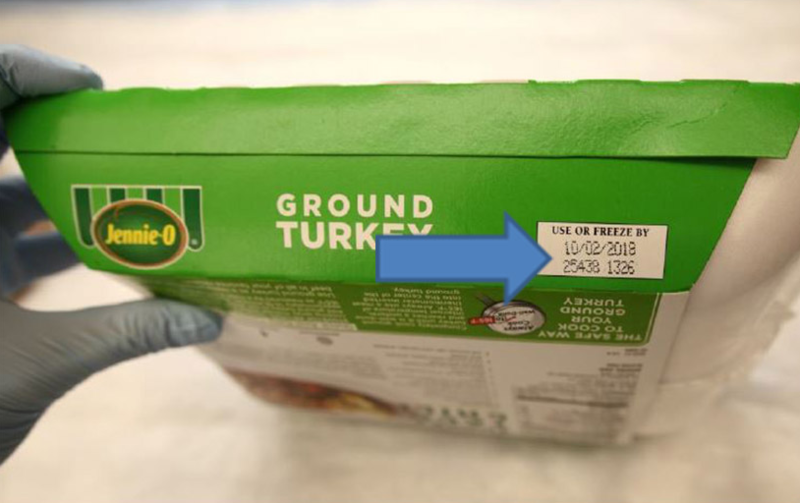 NEW YORK — Jennie-O Turkey is recalling more than 91,000 pounds of raw turkey in an ongoing salmonella outbreak. The recall is the first tied to an outbreak the U.S. Department of Agriculture says is widespread and likely affects a number of different producers in the industry. So far this year, the outbreak has resulted in one death and 164 reported illnesses in 35 states. About half of those sickened had to be hospitalized. Regulators did not say how many of those people were exposed to products sold by Jennie-O, a subsidiary of food industry giant Hormel. They say additional products from other companies could be named as their investigation continues. The products being recalled include one-pound packages of raw, ground turkey and were sold nationwide. They had a use-by date of October 1 or 2, but could still be in freezers. The packages are labeled with the establishment number "P-190." Regulators say the product should be thrown away. "Jennie-O Ground Turkey 93% LEAN | 7% FAT" with "Use by" dates of 10/01/2018 and 10/02/2018. "Jennie-O Taco Seasoned Ground Turkey" with a "Use by" date of 10/02/2018. "Jennie-O Ground Turkey 85% LEAN | 15% FAT" with a "Use by" date of 10/02/2018. "Jennie-O Italian Seasoned Ground Turkey" with a "Use by" date of 10/02/2018. In addition to ground turkey, salmonella has also been detected in raw turkey pet food and live turkeys, an indication the bacteria is widespread in the turkey industry. Salmonella in food is estimated to be responsible for 1 million illnesses a year. Children under 5, the elderly, and people with weakened immune systems are more likely to have severe illness from contaminated food that could lead to hospitalization. "Most people get sick between 12 and 72 hours after coming into contact with salmonella bacteria," the CDC's Dr. Colin Basler told CBS News. "Most people get diarrhea, abdominal cramps, and a fever." Experts urge consumers to practice good food safety when handling raw turkey in the kitchen this holiday season. That starts with thawing in the refrigerator, not on the countertop. "We want to make sure people are washing their hands after handling raw turkey and making sure people are cooking turkey to an internal temperature of 165 degrees," Basler said. "If you cook turkey to the internal temperature of 165 degrees this strain of salmonella should die." This includes leftovers, too. They should also be reheated to an internal temperature of 165 degrees. Use a food thermometer to make sure foods have have reached a safe temperature before serving. Consumer Reports also recommends you don't wash raw poultry before cooking, as this can spread germs. Also make sure to thoroughly clean utensils, cutting boards, counters and any other surfaces that may have come into contact with raw turkey.